Pet Beds.....so many types to choose from! We all love our pets so much, but to what extend does that love go? Would we ask those sweet little doggies to sleep on a cold floor? Heck no! Not my sweet pups! 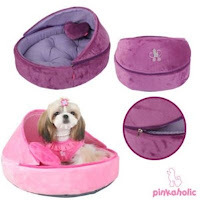 Just like humans, pet beds come in a variety of sizes, colors, brands, price range and comfort. Some pet beds look just like our human furniture and some pet beds are made with the older dog in mind. Some pet owners want their pet’s beds to match the décor of their home, no problem at all. Where does your pet sleep? Some pets sleep in the living room, some pets sleep in the owner’s bedroom. What is the size of your pet? If you have a jumbo dog, chances are.. He will stretch out and won’t even be on the bed anymore. If you have a small little pet, buy one that fits his size so he will be comfy and not feel lost on the bed. Do you prefer to have one to wash a lot? If so, watch for removable dog bed covers that you can wash in your washing machine. What is your price range? There are dog beds that range in so many prices; you can choose a cheaper end pet bed (especially the way the economy is) or more of an upscale dog bed if you have a doggie Diva. There are so many options available these days for a pet bed: heated beds, pillow beds, pet dens, furniture style beds, novelty fun beds or outdoor pet beds and the list goes on. The choices are unbelievable!! There are cat beds too! Humans sleep on comfy mattress’s so why not put your best buddy on a bed just as wonderful as yours! We are so busy with our own periodontal care, trips to the Dentist, teeth whitening, gum care and flossing that we forget that our pet’s teeth are of great importance too.. until we smell that breath! MAN! What did he eat? Your dog probably won’t LOVE having their chompers brushed but it really is a necessity, especially if he has yucky breath. With repetitive care and brushing he might actually start to like it. If you are not able to have your Vet clean their teeth (which is the most recommended way), learn how to brush your dog's teeth yourself. A quick brushing a couple of times a week is far better than nothing at all. A pet toothbrush ~ there are many to choose from-ones with finger attachments, ones with extra fancy handles and bristles , you can just use a gauze sponge if you want. Pet Toothpaste~ Maybe a poulty flavored toothpaste or something a bit sweet or just plain old Baking Soda will work. Don’t use human toothpaste. Go ahead and prepare for clean up with the washcloth and towel because it can get messy. There are pet care sets available like Kissable dog toothpaste and toothbrush that will include both items needed, all in one. Feeding your dog dry dog food or hard dog biscuits everyday and provide a hard toy or bone to chew on will help with odor and will help prevent periodontal disease and other infections and gum diseases. Certainly a dog mint or two every now and then won’t hurt either! Valentine’s Day is one month away and it is a time to let those we love know it! Don’t forget the one who loves you unconditionally, the one that doesn’t care what you look like, or how much money you make, or even that you have been a bit grumpy lately. Your dog is beside you all the time and loves you no matter what, and he shouldn’t be left out on Valentine’s Day. We all know that times are hard these days, but giving a pet Valentines Day gift isn’t hard and won’t break your bank but will show him that you love him and that you appreciate him for being a constant companion. 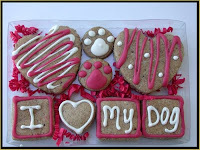 A Valentine’s Day Dog Tank would be a great little outfit for your dog on the special day or even a Puppy Love Sweater. 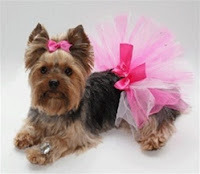 Maybe you have a prissy little one, and for our doggie diva’s a Shades Of Pink Princess Bling Dog Tutu and Matching Hair Bow or a Sterling Silver Puff Heart Collar Charm. Maybe you need something a little more “manly”, the Black Studded Tank Top should do the trick. If you dog isn’t cool wearing clothes, try out some dog treats, dog toys or maybe a precious new collar! We know that all our pets could use a new bowl and this Valentine’s Day, there are great new dog bowls to fit your pet’s personality. Whatever you choose, whether it’s a gift, or extra time with your pet, or just a small treat, let him know how much you love him on this Valentine’s Day! With the Artic Blast headed our way and colder temperatures than normal across the country and some wind chills down to zero, it is so important to keep our family pets safe and warm. Because animals rely on their human caregivers to keep them safe, especially in these harsh winter months, it is important to take a few extra steps to take care of the ones we love. You might think that because dogs have fur that they are protected from the cold and harsh weather, but the fur has a tendency to gather ice or snowflakes that can make even the furriest dog cold. Dogs get cold and there are things that we can do to prevent serious health issues in the dead of winter. Make sure that your dog has an adequate doghouse outside if you have to leave him out. Although it is not recommended to leave any pet outside in the cold elements, if they absolutely must be left outside please make sure there is a closed warm area for him to lay. Keep your pets away from Antifreeze. Dogs love it but even in small amounts could be deadly. Make sure you are checking your dog for frostbite and drying his fur when he enters back into the home. 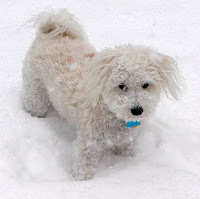 Ear tips are especially susceptible to frostbite on dogs and snow can get up in the footpad of your pet as well. Get your dog winter apparel to help make them more comfortable. There are dog boots to protect the paws and even dog socks for those cold nights. 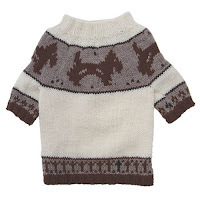 Try a nice dog sweater or winter coat to make sure they are warm when going out into the freezing winter weather. Trim the hair around your dog’s feet. You can even apply Vaseline or cooking oil to the bottom of their feet before going outside. The layer of oil or moisture barrier will prevent ice from sticking to their paws. 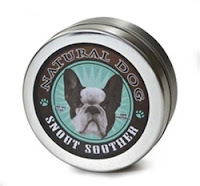 You could try Snout Smoother for chapped ears and dry skin! Try not to use salt on the sidewalks because it can be irritating to the footpad. If they do get salt on the foot are, wipe off as soon as the come in. Watch your pet’s diet. Pets can get lazy during the winter months and can gain excessive weight. Find interactive dog toys to keep him busy and moving around. Don’t ever leave your dog in a car, hot or cold. If you cannot take them in, leave them at home. Keep your dog out of water during freezing weather- canine hypothermia can set in quickly. Keep him away from rivers, lakes and stream as the ice can break and they fall in. It isn’t too hard to take extra precautions for our pets, especially in weather like this and by making some adjustments and buying a few extra pet accessories, he will be warm and toasty when going outside! Pets are making a big statements in the United States! You have seen the commercials, watched the videos about animal cruelty and for me, I cannot hardly continue to watch as it becomes too heart-wrenching. There could be a light at the end of the tunnel for pet's everywhere! Pet stores all around the US are making a statement of faith by putting up the “puppy friendly” signs in their windows. The puppy friendly pledge states the store’s commitment to NOT sell puppies and stand firm and support local animal adoption programs and help to educate their customers about how to find a puppy and where to find reputable sources to purchase a pup. 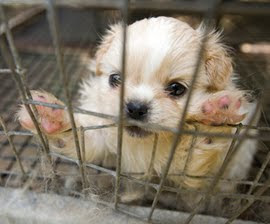 "Pet stores that profit from the cruel puppy mill industry need to stop their puppy sales. We encourage people who want a new pet to first consider adoption from local shelters and rescue groups, which are filled with healthy, loving dogs who need a family of their own this holiday," said Stephanie Shain, senior director of The HSUS' puppy mills campaign. • Puppies born in puppy mills are more likely to develop health and/or behavioral issues than puppies who are born to reputable breeders. • Puppy mills contribute to the pet overpopulation problem, which results in millions of unwanted dogs euthanized at shelters every year. There are so many things that we can do as pet owners to help stop the cruelty to animals and mass production of dogs and puppy mills. You can donate or visit the Human Society’s site and make a difference. Check independent retailers in your area and see if they have signed the puppy friendly pledge, and if not~ encourage it~ as it is our duty as pet lovers and humans to stop this inhumane treatment of animals. Posh Puppy Boutique believes in dogs and animals of all kind and encourage love and support for animals. Join us in making a difference today!